Anti-Inflammation. 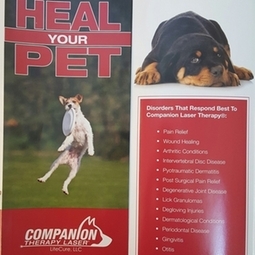 Laser Therapy has an anti-edema effect as it causes vasodilation, also because it activates the lymphatic drainage system (drains swollen areas). As a result, there is a reduction in swelling caused by bruising or inflammation. Anti-Pain. Laser Therapy has a very beneficial effect on nerve cells by blocking pain transmitted by these cells to the brain and decreasing nerve sensitivity. Accelerated Tissue Repair and Cell Growth. Photons of light from lasers penetrate deeply into tissue and accelerate cellular reproduction and growth. The laser light also increases the energy available to the cell by increasing ATP production so that the cell can take on nutrients faster and get rid of waste products. As a result of exposure to laser light, all cells, including the cells of tendons, ligaments and muscles are repaired faster. Improved Vascular Activity. Laser light will significantly increase the formation of new capillaries in damaged tissue; that speeds up the healing process, closes wounds quickly, and reduces scar tissue. In addition to angiogenesis, it causes temporary vasodilatation, an increase in the diameter of blood vessels. Improved Nerve Function. Slow recovery of nerve functions in damaged tissue can result in numbness and impaired limbs. Laser light will speed up the process of axonal regeneration, nerve cell reconnection, and increase the amplitude of action potentials to optimize muscle action.